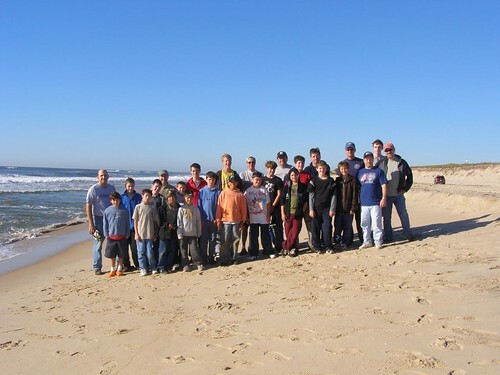 In one the most memorable camping outings in memory, Troop 353 visited Hither Hills State Park at Montauk in mid-October for an overnight just over the dune from the crashing Atlantic Ocean. The trip was delayed by 12 hours by violent and wet weather on the East End, but the troop arrived in Montauk in good order early on Saturday after a quick drive. After check-in, the boys and adult leaders – more than 25 of us altogether – headed over to Deep Hollow Ranch for a 90-minute ride on horseback through the fields and scrub pine until about half-way through, the trail opened on a high bluff overlooking the bay and the lighthouse beyond. The horses walked along the beach, and the riders enjoyed the scenery. After the ride (and once some feeling returned to the dads’ lower extremities) it was back to the campsite, where the troop pitched tents and began the first of three meals that they were to cook. Some scouts went for a dip along the ocean’s edge (it was rough), threw the football around, played tetherball, or took a hike. Orienteering and food prep were a couple of the advancement activities on the schedule. As the sun dipped beyond the dunes, dinner was prepared and the troop settled in around the campfire before doing some star-gazing on the beach, and then turning in – sleeping to the sounds of the surf. The next morning, after a beautiful and quiet night (massive wind gusts, aside), we cooked breakfast and broke camp for the ride home – everyone in agreement that Hither Hills should rate a return trip from Troop 353. For more great pictures, click here. 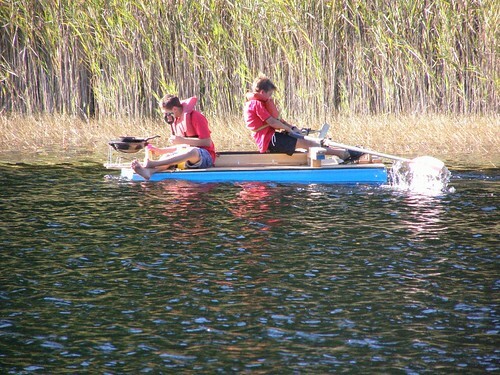 Clear Lake and clearer weather provided the perfect setting for a waterborne adventure in the culinary arts for Troop 353 Scouts, as rowing pancake masters Joseph and Anthony took home first prize in the rowed vessel portion of the annual Kon Tiki overnight on the nearby Putnam County reservation. Fifteen Scouts and ten adults made the trip, and many took part in the maritime mayhem on the pond, testing the rather advanced design of a special craft created by Joe’s dad Khalil. A success, without doubt. The raft, with its sliding seat and long oars, proved somewhat tricky to operate but once set in motion, it broke several decades-old Clear Lake speed records and, indeed, challenged the very notion that pure speed in a vessel with a fire on deck is unattainable. The fires of the campfire (with hilarious skits) and the cookfires also burned brightly, as the Scouts finished a day that also included archery and team-building games, advancement work – and the mother of all acorn wars. A clear night brought lots of star-gazing as well as ample sleep, even for Committee member Ben who nurtured his inner survivalist by constructing a rugged hut of twigs and branches and sleeping in it. This writer preferred his snug tent, the juicy steaks prepared by Assistant Scoutmaster Dennis for the Old Goats Patrol, and the hot coffee in the morning, following another successful Troop 353 camping overnight. The next morning, an industrious group of scouts learned a bit of map & compass and hiked a few miles (indirectly) up to site #40 (location of our November outing), while others completed Totin’ Chip with Assistant Scoutmaster Michael D. For more great photos of this beautiful weekend of camping, click here.